BackSlash Linux is one of the newest Linux distributions developed in India, and that too, by a 20-year-old. 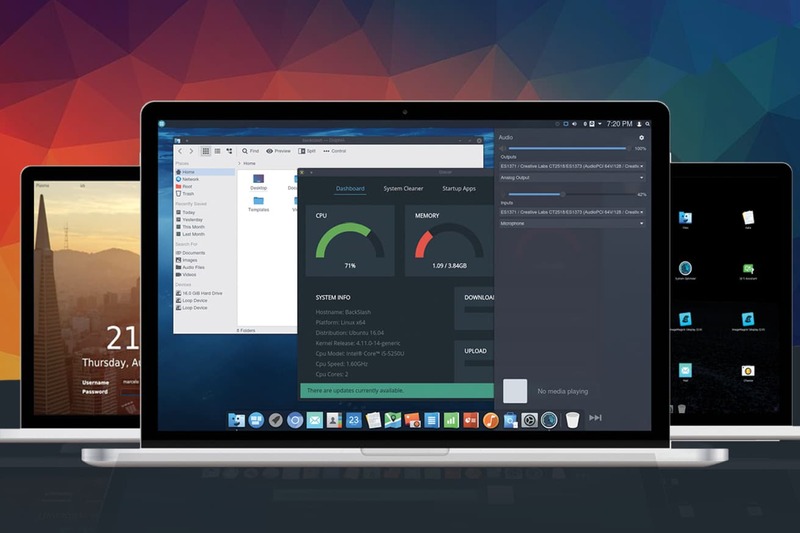 The operating system has a mix of Ubuntu and Debian platforms, and offers two different worlds under one roof, with KDE and GNOME integration. “It is not very hard to build a Linux distribution,” says Kumar Priyansh, the 20-year-old developer who has single-handedly created BackSlash Linux. As a child, Priyansh had always been curious about how operating systems worked. But instead of being merely curious and dreaming of developing an operating system, he started making OpenSUSE-based distributions in 2011 to step into the world of open source platforms. He had used the SUSE Studio to release three versions of his very own operating system that he called Blueberry. All that experience helped Priyansh in bringing out a professional Linux platform that debuted as BackSlash Linux in November 2016. “To try and build a new Linux distro I decided to dedicate a lot of time for development, and started attending online tutorials,” says Priyansh. Going through many online tutorial sessions, the Madhya Pradesh resident observed that he needed to combine multiple parts of different tutorials to understand the basics. “I started connecting parts of different tutorials from the Web, making an authentic and working tutorial for myself that allowed me to build the necessary applications and compile the very first version of my own distribution,” he says. Priyansh picked Ubuntu as the Linux distribution to build his platform. But to give users an even more advanced experience, he deployed Hardware Enablement (HWE) support that allows the operating system to work with newer hardware, and provides an up-to-date delivery of the Linux kernel. The developer also added a proprietary repository channel that helps users achieve better compatibility with their hardware. “I ship the platform with a proprietary repository channel enabled, which Ubuntu does not offer by default. This is because I don’t want BackSlash users to hop on different websites for unsupported hardware,” says Priyansh, a Samrat Ashok Technological Institute alumnus. Although the original aim of BackSlash Linux wasn’t to compete with any other Linux distros, it has a list of features that distinguish it from others. “I start building at the stage that the other distros stop their work. I craft solutions around what users want and continue to improve things until everything seems pixel perfect,” affirms Priyansh. The current beta version of the platform includes a new login screen that displays aerial background video updates, fingerprint protection for logging in, access to the terminal and other apps, multi-touch gestures, the coverflow Alt+Tab switcher, Snap support, and an updated Plasma Shell. There are also new updates, including Wine 2.14 for running Windows packages, Redshift (a blue light filter), a new email client, an enhanced system optimiser with an advanced app uninstaller and Google Play Music Desktop Edition. BackSlash Linux is not targeted at enterprise users. Having said that, the operating system does have some security features to make the experience safer for those who want to begin with a Linux distribution. It receives security updates directly from Canonical to keep the environment secure. The preinstalled System Optimiser app also helps users optimise performance, toggle startup programs, and uninstall applications and packages. Additionally, community feedback that has recently started rolling out enables Priyansh to enhance the security of the platform. “The current beta release is doing quite well and receiving much praise from the community,” the developer says. Experts often believe that selling an open source solution is more difficult than trading a proprietary technology. For BackSlash Linux, Priyansh has opted for a model that involves receiving donations and sponsorships. “Our primary source of revenue will always be donations and sponsorships for the project,” Priyansh asserts. BackSlash Linux, available on AMD64 and Intel x64 platforms, certainly has the potential to grow bigger. Priyansh is planning to add his own technologies to the platform, going forward. He is set to develop his own Web browser, music player and some ‘awesome apps’ to take the ‘Made in India’ operating system to the global stage. “There are also plans to build a custom compiled Linux kernel in the future to deliver better support out-of-the-box,” the developer concludes. Next article‘Open Source Initiative’ turning 20 this February!